With a second recession looming, Britain is facing a moment of truth. This book examines how the leader of the industrial revolution came to exhibit the features of a ‘developing country’; chronic debt, volatile growth and vulnerability to external events. Going South explains how this has happened, arguing that the time for quick fixes is over. The redoubtable team of Elliott and Atkinson have done it again. 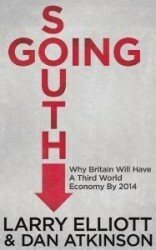 Having predicted in their last book that the boom would end in tears, they now draw on their deep knowledge of Britain's economic history to warn of the danger of absolute, not relative, decline. Controversial - but disturbingly convincing. And a great read.